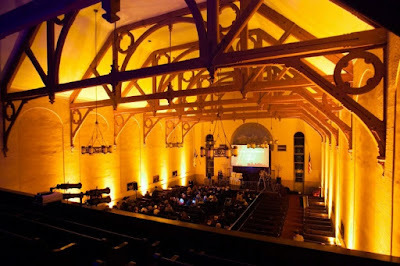 A mission church, the West Twenty-Third Street Presbyterian Church was completed on December 19, 1833 for the “needs of the hitherto neglected district,” as explained by The Times. The congregation would replace the little wooden structure twice, the last being built in 1854 on 23rd Street near Seventh Avenue. Another Presbyterian congregation would soon share the block. When the West Twenty-Third Street Presbyterian Church dedicated its new structure, the Third Reformed Presbyterian Church was located on Waverly Place. On May 26, 1856 that congregation received its new pastor, Rev. James Renwick Wilson Sloane. In 1859 Sloane and his trustees purchased land at No. 238 West 23rd St. and began construction of what The New York Times described as “a small but comfortable edifice of brown-stone.” The new building was 25-feet wide, the width of an ample residential lot, and stretched 100 feet to the rear. Ecclesiastical architecture had changed greatly from the 1830s when the first West Twenty-Third Street Presbyterian Church was built and churches mimicked Greek Temples with triangular pediments over columned porticos. The new Third Reformed Presbyterian church, costing $30,000 reflected the most current style. It was generally Romanesque; but was heavily influenced by the relatively recent Gothic Revival style in its crenelated roofline and stubby spires. The church was dedicated on February 5, 1860 with three services throughout the day. The morning service was conducted by pastor Rev. J. R. W. Sloane who rarely held back on his strong stands. Among his most fervent issues at the time was, understandably, slavery and what seemed to be inevitable war. Unlike some other clerics who denounced war and its necessary violence and loss of life; Rev. Sloane saw the Civil War as God’s tool for man to stamp out slavery and oppression. Five months after the firing on Fort Sumter he supported the war in his sermon of September 26, 1861. Rev. 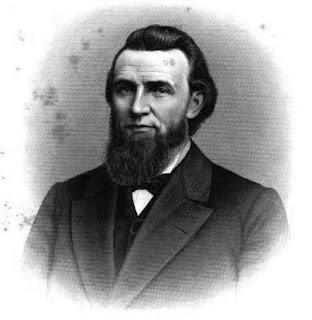 J. R. W. Sloane stepped down in 1868 to become Professor of Theology in the Reformed Presbyterian Seminary in Pennsylvania. There would be no pastor able to match his fire at Third Reformed Presbyterian for decades. It can hardly be deemed a coincidence that on the same night in February 1878 both Presbyterian churches on West 23rd Street were burned. On February 17 The Times reported that the interior of the Third Reformed Presbyterian Church were gutted “but its walls are still standing.” There was a discrepancy at the time as to whether the structure was insured. Two days later the church’s pastor, Rev. David Gregg, visited the ruins which were “sufficiently cool in spots to enable the workmen to dig for the safes.” Somewhat surprisingly, he found a miraculously-surviving item. The New York Times reported that as he sifted through the still-smoldering ashes, he “was rewarded by securing the church Bible. Its covers were burned off, and the edges of the pages were charred, but the printed pages were intact.” In the cellar, where the Sunday School rooms were, the pews were intact and a cupboard holding the dishes “used by the ladies at ‘strawberry festivals’” was undamaged. Donations were received to rebuild the interior of the church. Architect John Correja was commissioned to design the $12,000 of reconstruction. While Rev. Gregg did not have the personality and oratory skills of Rev. Sloane, he did carry on the tradition of reform and outreach. On May 24, 1880 he made the church available for the sixth anniversary meeting of the Christian Women’s Temperance Union. During that meeting it was determined “to establish the Christian Refuge for Intemperate Women, and $6,000 was needed for that purpose,” according to the New-York Tribune the following day. Temperance had become one of the foremost issues in churches, and it was a topic that would be repeatedly addressed from the pulpit here. On January 18, 1887 Rev. Gregg tendered his resignation following his acceptance of another position. By 1895 his place had been taken by the Rev. F. M. Foster—a man whose convictions and rhetoric could easily be compared with Rev. Sloane's. Journalists would question Foster for years about his staunch stand against voting. But the opinionated preacher had much more to talk about than politics. In the last quarter of the 19th century West 23rd Street had been the center of Manhattan’s theater and entertainment district. It was a simmering issue for Rev. Foster. Two days before Christmas, 1900, he railed against theaters from the pulpit. His whereabouts were finally discovered in April 1914 when The New York Times reported “Mr. McLean is now recuperating from a prolonged illness, according to his wife, in Mrs. McLean’s home in Maryland.” The out-of-state summer home made it difficult for authorities to get their hands on him. But Rev. Foster was resolute. He kept up the pressure on officials until finally, in June 1916, the Frederick, Maryland District Attorney’s office agreed to McLean’s extradition. Renovations included a new entrance. The congregation, which had been founded in 1865, made only minor changes; most notably the replacement stained glass windows executed by Isabel Hawxhurst Hall, one of the few female stained glass artists at the time; and later the robust carvings over the entrance doors and granite cladding of the base. Nearly a century later an ill-advised coat of paint covers the brownstone and the little spires have disappeared from the parapet. This, along with the altered entrance and the loss of some carved elements, disguise the age and architectural integrity of the structure. 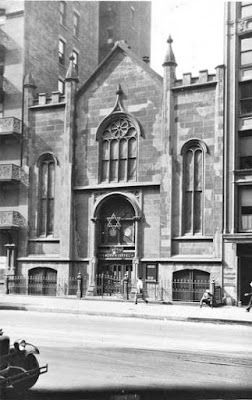 Nevertheless, the building now known as “The Chelsea Shul” has a long and venerable history. Another long journey through the last century and a bit beyond - with thanks. The schul was one of the first houses of worship in the city to hang out the star-spangled-banner after the attacks of 2001. I'm wondering if the replacement stained glass was worthy of mention.